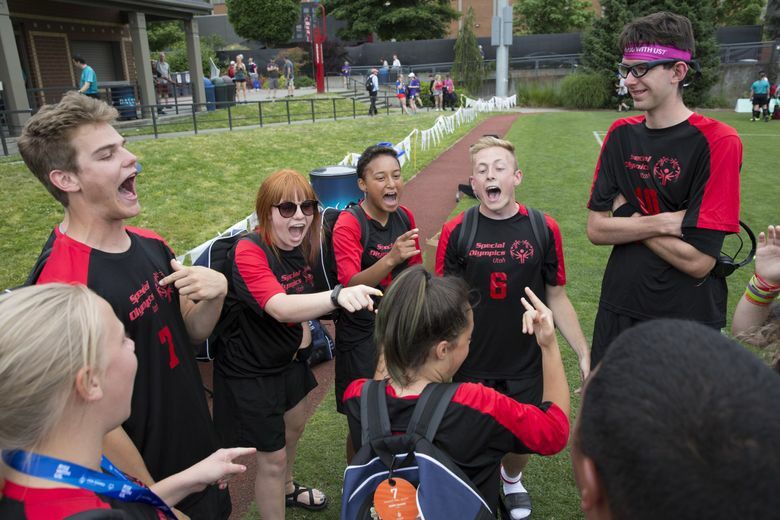 The Utah unified soccer team has become famous among the other delegations for their singing and dancing. 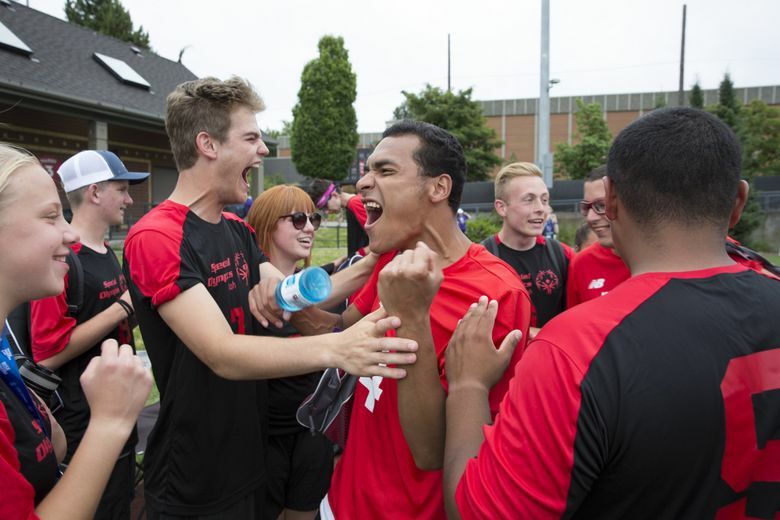 At the 2018 Special Olympics USA Games, Utah’s 5 vs. 5 interscholastic unified soccer team is not as much known for what they can do on the field as they’re known for being the life of the party. 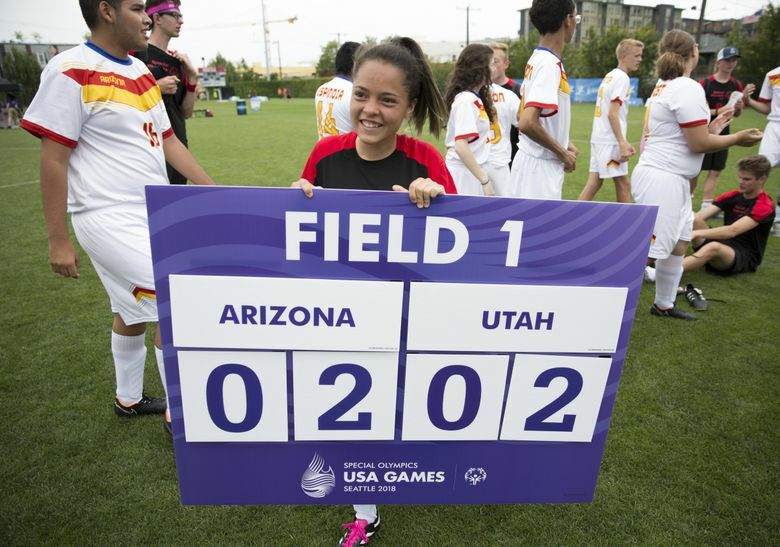 At Sunday’s opening ceremony, when all the delegations were filing onto the field, the procession got backed up, and the Utah team decided that while they were stuck in line they might as well sing some songs. Their song of choice ended up being “I Want it That Way,” a 1999 classic from the Backstreet Boys. They were all familiar with it, and so they kept playing it and singing along until everyone had mastered the lyrics. And that was only the beginning — the team has since incorporated a choreographed routine where they belt out the song into their warm-ups (and sometimes their post-game huddles). They say they’ve become famous among the other delegations for their singing. Their popularity was apparent when Team Massachusetts rushed up to tell the Utah players that they’d just won their match. 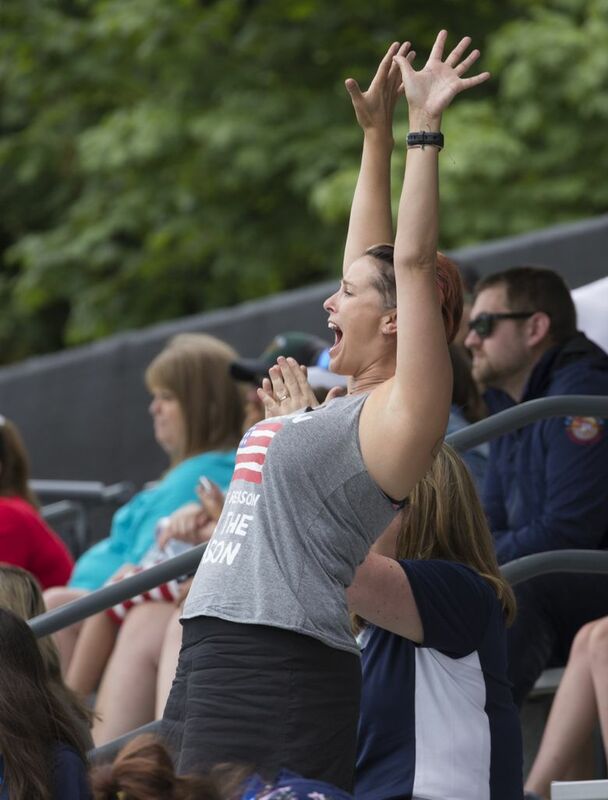 As if they had known them for years, the Utah team started jumping up and down and cheering with their new friends from across the country. “We had people be like, ‘we want to be on the bus (that goes from the dorms to the games) with Utah,’” Aubre Cooper said. The Utahns dance, too. One of the highlights of the trip for the squad was Tuesday night’s dance party in the dorms for athletes, DJed by an athlete from another team. The group was already talking about round two, a dance party for the fourth of July, that will happen later in the evening. The team — Addie Morley, Aubre Cooper, Boston Iacobazzi, Jaden Hartman, Jocelyne Lopez-Peralta, John Ruff, Moi Gonzalez, Sierra Webster, and Tanner Cluff — features students and recent graduates from Hillcrest High School in the Salt Lake City area. 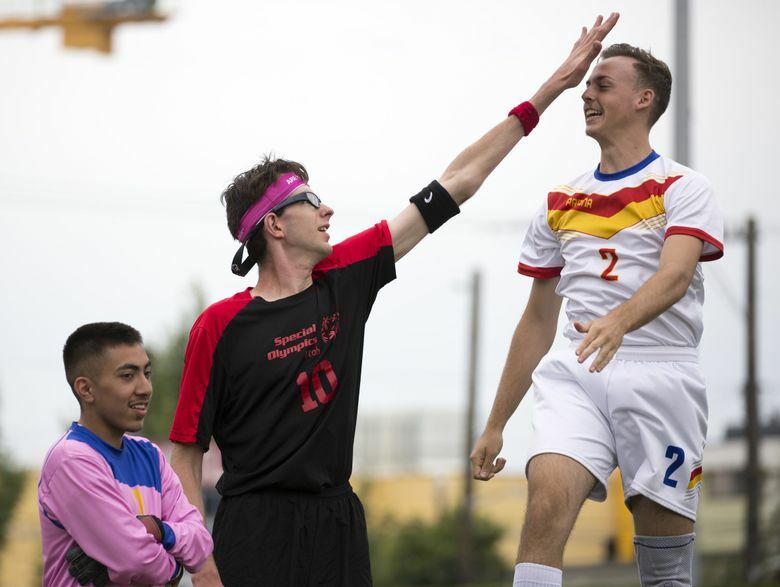 Unified teams comprise both athletes with intellectual disabilities and partners without disabilities in an effort to promote inclusivity in sports and beyond. 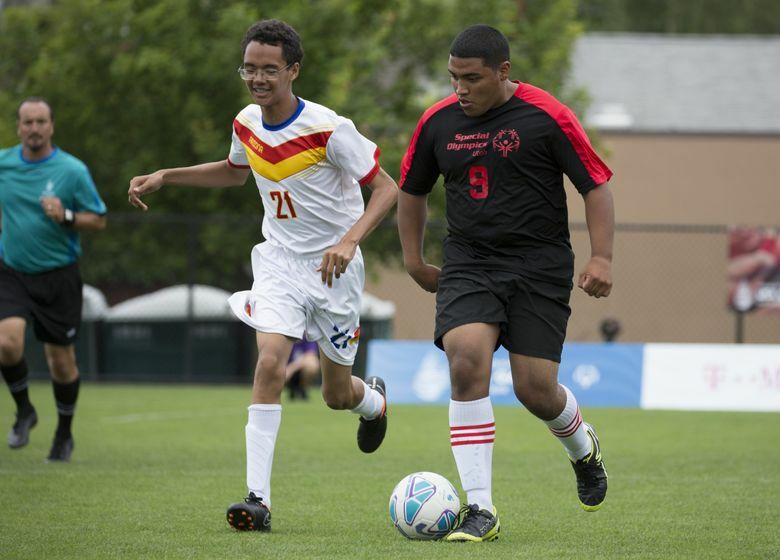 In unified soccer, partners are encouraged to not take over the game and to set up the athletes to score. 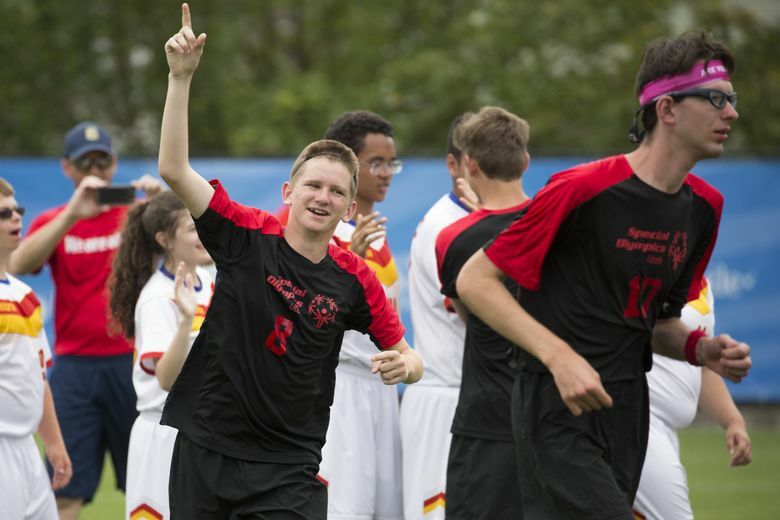 Off the field, the distinctions between athlete and partner fall away – the team is a big family. When they’re not singing, dancing, or playing soccer, they’ve been sightseeing and playing games like ‘Speak Out’ in the dorms (Iacobazzi even brought a pop-up hammock to crash in one of the rooms). They talk up each other up, too. Ruff brought up Hartman’s penalty kick from their first game on Wednesday. During the Opening Ceremony, the team even egged on Cooper to rush the stage to meet Charlie Puth. Even though security stopped her, she didn’t seem to regret any of it. She said it was the highlight of her week, one full of singing, soccer, and just having fun with some of her favorite people.